It is that time of year again. The time when people like me who like to play outside in the Adirondacks turn their focus to cycling and other non-snow sports. Well, their primary focus. Whiteface is still open and the back country is viable, so skiing remains on my mind. Until the last flake of snow disappears, I might add. Ooops, distracted again by thoughts of skiing. Back to Spring in the Adirondacks....I had my first road bike ride last Saturday, but most of the die-hard cyclists around have been out many times already. For my part,it was great to get out in the balmy mid-50 temperatures down the hill in the tropics of Keene, New York. The Adirondacks are a great place for road bike riding and you'll hear more about it here as the Spring progresses to Summer. We have a very active cycling community with new races scheduled every year. 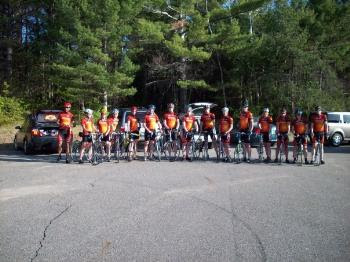 A local sports club, Team Placid Planet will host the Adirondack North Country Race Weekend, June 13 and 14. There will be a road race in Wilmington on Saturday with plenty of categories from beginner to pro racer, going distances from 12 to 68 miles. Last year's race was well received and they've added a criterium to the weekend which will be held in Saranac Lake on Sunday. Stay tuned to this blog for more road cycling news.